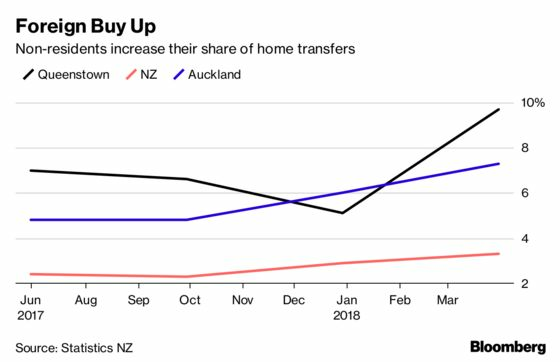 (Bloomberg) -- Foreign investors are racing to buy New Zealand homes before rules that limit overseas sales are enshrined in law. In the South Island resort town of Queenstown, about 10 percent of home transfers in the first quarter were to people without New Zealand citizenship or a resident visa, Statistics New Zealand said Thursday. That’s almost double the share of the previous three months. In Auckland the proportion rose for a second-straight quarter, climbing as high as 19 percent in some suburbs of the nation’s biggest city. The government came to power late last year pledging to tackle a housing affordability crisis with a raft of measures, including a ban on foreign speculators buying residential property. Its proposals are currently passing through parliament and are yet to become law. “Consultation about amendments to the Overseas Investment Act may have been a factor in recent increases in the proportion of transfers to non-New Zealand citizens and residents,” Melissa McKenzie, property statistics manager at Statistics New Zealand, said in a statement. Demand for property and a supply shortage has seen values soar the past six years, although central bank rules on lending have slowed house-price inflation from a double-digit pace. Prices nationally rose 6.9 percent in May from a year earlier, according to Quotable Value data today. Still, average prices in Queenstown rose 9.6 percent to NZ$1.15 million ($810,000), making it the most expensive place to buy a home outside several Auckland suburbs. Nationally, just over 3 percent of the home transfers recorded in the first quarter were to non-citizens. As well as purchases, transfers include homes of deceased family members, marriage settlements and other administrative changes. The statistics agency produced the data for the first time.